The prettiest of colours, these paper decorations really spoke to my heart. They are from the new collection at Cox and cox online. As too,the white rose garland and paper rosettes below. My copy of Rachel Ashwell's new book Shabby Chic Inspirations & Beautiful spaces arrived and I couldn't wait to show you some of my favourite pictures from inside it's pages. These are pages that I know I shall be turning for some time to come too. There is much to read about her time in Nottinghill London and the people she was inspired by. The bedrooms here are in the home of Pearl Lowe, beautiful soft peachy pink, with a brighter chandelier and a butterfly mirror, a distressed chest in chalk pink and floral bedding. Just perfect. Rachel Ashwell's shabby chic range is now online at House of Fraser in the Uk. As Rachel's books are amongst my favourites, and i love everything about her style of decorating, i have been excitedly awaiting the launch. This collection, the first at House of fraser (a well known department store in the Uk) includes many beautiful pieces, in both furniture and accessories, and covers every room of the home, dinning, bedroom, and living. This dressing table is my favourite from the bedroom range. Rachel's style has always been exactly how i choose to decorate, a mix of subtle florals in pastel shades, and natural colours like stone, beige, white and greys. Incorporating french style furniture and vintage inspired fabrics and china. Giving a lived in, comfortable home, with a feminine asthetic, that does not overwhelm. These are my favourites in the dining range, a set of cutlery and a porcelain dinner service. As well as sofas and bedroom furniture there are cushions, scented candles and throws to come. And a beautiful Kensington tea set in floral pinks. Here's the link incase you'd like to take a browse of the Rachel Ashwell Shabby chic collection at House of fraser. I am so glad this range is for sale in the Uk, as for so long the products Rachel designed such as bedding, were only avaliable in the States. I just know it will be a big success and i hope they have plans to continue with the range for future seasons, imagine if they were to bring out some christmas accessories! Celebrate the everyday, add a special garland to your world. I thought today, i would share the cards i have on my bedroom wall. 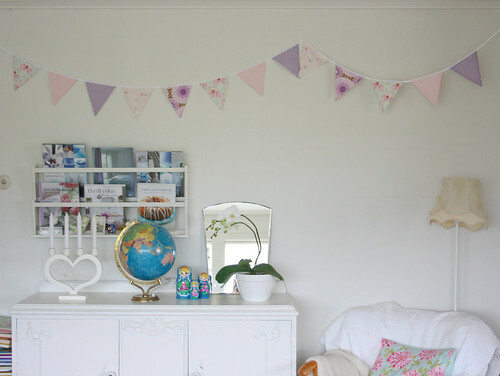 Do you like to display things you recieve in the mail and from friends? Its something i have always liked to do in my home. I have tried various ways - a wire heart, a fabric covered board with ribbons to slot images behind, and a magnetic board. I like those, but i also like the string of cards idea here. Where i use heart pegs, to clip things to a cotton tape/ribbon. I got the peg set a while ago it was from the wonderful range East of India. I keep the cards there to inspire or uplift me, and i havent changed them for quite awhile. As you can see they include some of my favourite things...birds, butterflies, angels, roses, and in all the colours that i love too. The ivory butterflies are made of felt and have fairy lights within, they were from Laura ashley some seasons ago. The origami butterfly was beautifully made by Keri-anne, she has a new blog that you can find here: Sweet Days with Elle and Mia. Her recent post on her Bluebell fairy is a delight. I recieved my copy of the new interiors book, Decorate yesterday and couldnt wait to show you some of my favourite pages, as well as share my review. I must confess I have quite a collection of interior books upon my shelf, the ones with beautiful photos of people's homes. Decorate is by Holly Becker and Joanna Copestick with photography by Debi Treloar. The thing that surprised me upon settling down to look through my copy of Decorate for the first time, is how unique it is. Its not at all like other titles I have on my bookshelf already. Its a weighty book, both physically and in the amount of information it imparts. It could so easily be overwhelming, yet the balance is kept and it is interesting, informative, instructional and inspiring, in equal measure. The rooms are from homes around the world, which gives such a variety of styles from which to choose. The influence of different countries is evident yet the book retains an overall cohesiveness. I must admit to not always finding the text inviting to read in other decor books i own, and I tend to take in more from the photography alone. Yet here in Decorate the writing sections are laid out in such a way that you find yourself drawn into reading them, almost without trying! I especially like the quotes (both in large type and smaller) dotted through out the pages and inside the front & back cover. I'm a quote loving girl, but as well as simply bring pretty to look at, the words within them are really helpful tips that stick in your mind. There is a place for online decorating inspiration of course and especially blogs, which bring us so much on a regular basis (the author Holly writes one of the best herself) but then there is still equally, a place for books. It seems easier to find the spark of an idea for your own decor when you can turn the pages at leisure with a nice cuppa and notebook to hand. I have only had my copy a day and already I have an idea for a fireplace and a bathroom wall. Two things I had searched online for inspiration for- and not found. that can't fail to inspire whatever your budget or period of home. there are little touches to replicate. There are also practical tips you can use with ease, ways to organise your belongings in a stylish way and recommendations on how to plan your projects to successfully fufill what you envision. It will help you add colour and life to your home, in however small or large a way you would like. I guess it's like having an interior designer all to yourself,whenever you need their advice you just need to open the book and turn the page! This feature was in BBC Homes and Antiques magazine last month, and was styled by Selina Lake with photos by Debi Treloar. i have been enjoying so much lately the interiors photos shared at Sanctuary such as this post Vintage Haven and My Heart is happy at Ruby blooms, so i felt i wanted to return that inspiration! I cannot decide quite which i prefer, finding favourites at flickr, or pinning things at pinterest. Either way, there is inspiration everywhere it keeps me going. I think i will share here, the guest post i did on finding inspiration. I'll post that maybe tomorrow, incase you missed it at City of blackbirds. "Listen and be inspired, for in everything you see and do there is a gift"
This was a guest post i did over the summer at Rachel's beautiful blog Lovely Clusters. Just thought i'd re post it here, incase you havent seen it before and also so i can refer to it for all the links in the future. So I thought i would talk about one of my passions today as thats always a good place to start isnt it. One of my favourite things is collecting interiors books with vintage or flea market styling. I am sure we all have our favourites, among mine are Bazaar Style, Shabby Chic Interiors and Easy Elegance I dream of decorating in this style someday and like to be inspired by the vintage decoration i see in people's homes. Inside the pages of our favourite interior books, we see a complete look. Sometimes its a little daunting to achieve the same. Maybe as its not practical, affordable, or the items are hard to come by in the area we live. Maybe too, the people we live with, wouldn't be too happy with a full shabby-chic-d abode! Luckily the thing about vintage, is it can find a home quite happily amongst any style you may already have. You don't have to spend a great amount and add much, to still bring the essence of vintage to your home. Little touches such as old china,(like this set i got from Scotland lately) crochet throws, or repurposed fabrics can blend into your rooms and add a unique touch. Think of it like fashion where there has been an ever growing trend for mixing vintage with modern pieces. The secret is always to follow what you love and by adding only that, well, you can't really go wrong. I have gathered together some images here that inspire me with ways to add in touches of vintage. Old books, cushions, a pottery jug....china, bedding and postcards. But where to source these items, especially if there are no local flea markets or antique shops to hand....luckily we now have the wonder of online shops! Clever people who can come by the most special of old treasures and we get to browse them from our sofas! Rachel has done a beautiful job of highlighting just the type of shops we are looking for in the decor section of Lovely clusters. 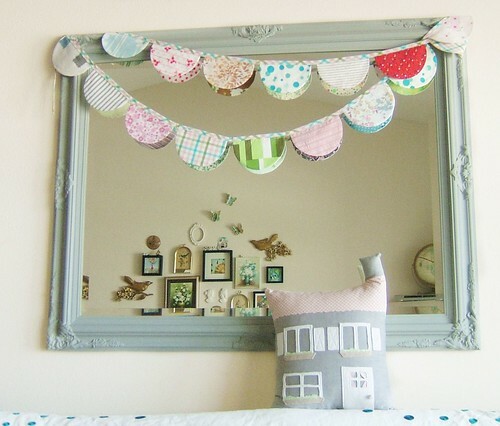 Here you'll find sections for wall decoration, cushions, ornaments and linens.